Guide to El Paso County Texas ancestry, family history, and genealogy research page. Birth records, marriage records, death records, census records, family history, and military records. El Paso County is located in the far south western corner of Texas where the states of New Mexico and Texas, and the country of Mexico meet. El Paso is presently its largest city. Across the Rio Grande is Chihuahua's largest city, Ciudad Juarez. Today it is a major international port of entry, and from its earliest days has been a significant customs and immigrations checkpoint between the United States and Mexico. 1850-- El Paso County was created 3 January 1850 from Bexar Land District. 1912 - Culberson County created from eastern portion of El Paso County. 1917 - Hudspeth County created from eastern portion of El Paso County. Local histories are available for El Paso County, Texas Genealogy. County histories may include biographies, church, school and government history, and military information. For more information about local histories, see the wiki page section Texas Local Histories. The City and county of El Paso, Texas : containing useful and reliable information concerning the future great metropolis of the Southwest ... 1886, El Paso Bureau of Information. Digital book online from archive.org. The Land Where We Live: El Paso del Norte, 1973, by Conrey Bryson. Pass of the North: Four Centuries on the Rio Grande, 2 vols., 1968, 1980, by Charles Leland Sonnichsen. El Paso: A Borderlands History, 1990, by W. H. Timmons. Souvenir of the city of El Paso, Texas. Photo-gravures. Digital book online at archive.org. San Elizario, 1973, by Eugene O. Porter. The El Paso Salt War, 1877, published in 1957 by Charles Leland Sonnichsen. Digital book on line at archive.org. Forty years at El Paso, 1858-1898; recollections of war, politics, adventure, events, narratives, sketches, etc., 1901by W. W. Mills Digital book online at The Portal to Texas History. El Paso County History from the Handbook of Texas Online. 1856 Texas and Part of New Mexico 1856 from the David Rumsey Map Collection. 1865 Best Route for the Movements of Troops from San Antonio to El Paso, Texas 1865 from the A.R. Roessler Collection, Texas State Archives. 1886 El Paso 1886 Panorama Map from the Amon Carter Museum. 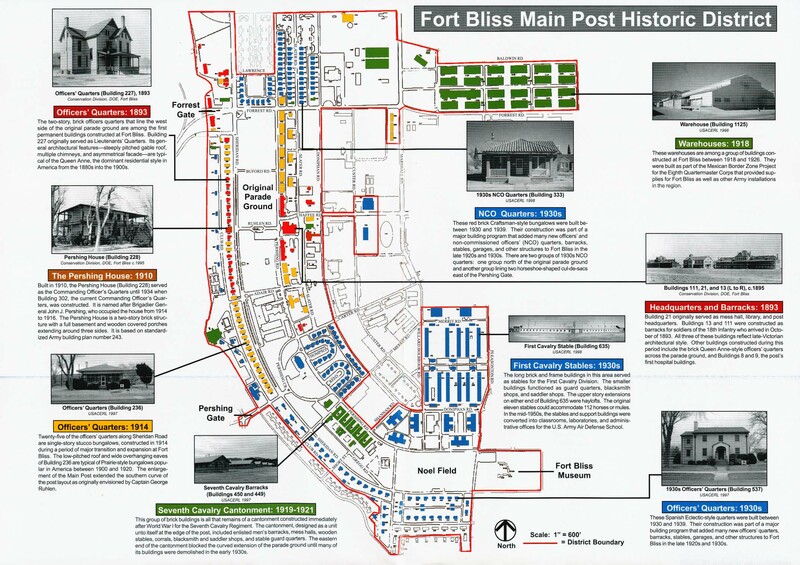 1891-1939 El Paso - Fort Bliss Main Post Historic District, 1891-1939 from the Amon Carter Museum. 1908 El Paso Quadrangle 1908 Shows contour lines, elevations, rivers, creeks, towns, cities, roads, buildings, schools, and railroads. Covers part of El Paso County. 1920 El Paso 1920 Automobile Blue Book Map from the Amon Carter Museum. 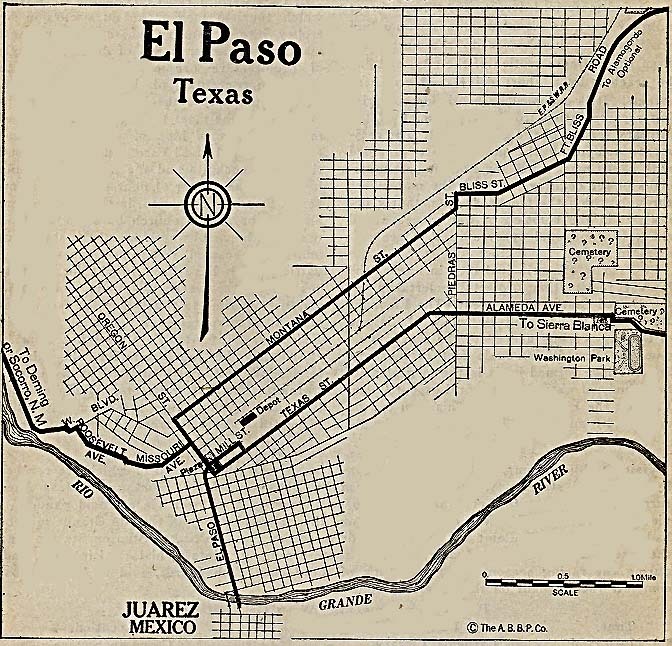 1940 El Paso General Highway Map 1940 shows detail of the City of El Paso and vicinity. Texas, West Portion Asher and Adams Map from the David Rumsey Map Collection. Do a El Paso County, Texas Genealogy Place-name search for these and other records in the FamilySearch Catalog (For instructions see FamilySearch Catalog Place-name Search). El Paso Herald, selected issues on line 1910-1914 from the Portal to Texas History. El Paso County Birth Records Search from EPCounty.com, the official county government website. El Paso County Death Records Search from EPCounty.com, the official county government website. 1890-1976 Texas Death Records [with images] Name index and images of statewide death certificates, 1890-1976. The name index has been created by FamilySearch and is tied to images of the Texas death certificates. Few certificates are available prior to 1903. 1964-1998 Texas Death Index [no images] Name index to Texas Statewide Death Certificates or four million people who have died since 1964. 1860 Census - El Paso County: Census images online at archive.org, 1860 Census transcription from the El Paso County TXGenWeb site. 1870 Census - El Paso County: Census images online at archive.org. Census images online at the TXGenWeb site. 1880 Census - El Paso County: Census images online at the TXGenWeb site. ↑ Handybook for Genealogists: United States of America, 10th ed. (Draper, Utah: Everton Pub., 2002), El Paso County, Texas. Page 663 At various libraries (WorldCat); FHL Book 973 D27e 2002. ↑ Handybook for Genealogists: United States of America, 10th ed. (Draper, Utah: Everton Pub., 2002), El Paso County, Texas . Page 658-677 At various libraries (WorldCat); FHL Book 973 D27e 2002; Alice Eichholz, ed. Ancestry’s Red Book: American State, County, and Town Sources, Third ed. (Provo, Utah: Ancestry, 2004), 655-665. ↑ Wikipedia contributors, "El Paso County, Texas," in Wikipedia: the Free Encyclopedia, https://en.wikipedia.org/wiki/El_Paso_County,_Texas, accessed 4 April 2019. This page was last modified on 11 April 2019, at 19:25.